Since 1970, the purpose of Earth Day has changed from one day each year when corporate polluters were exposed (what corporations should do), to a celebration of the personal (what you can do). Today’s bland, uncontroversial event typically features everything from 5k runs to esoteric spiritualties, but almost always carefully avoids any discussion of local polluters or environmental bad actors. If environmentalism is mentioned at all it is confined to climate change and recycling. The fierce green warrior has been replaced by the frugal green consumer now focused laser-like on the grass-fed beef at the local farmers’ market. Earth Day has converted attention from the public realms of pollution, environmental degradation, and over-development into the personal realm of the spiritual and inspirational. Certainly, all of us should improve our personal habits and recycle more, ride bikes, “reach out” to others, and listen to more Pete Seeger. But “all of us” don’t cause pollution from oil refineries; only a few people do, and Earth Day is the one day of the year they should be called out and shamed even more than usual. Corporate sponsors open their checkbooks for Earth Day to avoid having individual companies’ behaviors singled out for scrutiny. To accomplish this, they are willing to furnish unlimited seedlings, paper bags with green writing, and funds to print brochures on how to recycle containers that shouldn’t have been produced in the first place. And it is not as though corporate malfeasance was eliminated in the years after the first Earth Day. To take one of many examples, since 1970 the entire industrial factory farm (concentrated animal feeding operation, or CAFO) system has flourished. Today commercial meat factories have taken over most of the meat production in the US. Over 20,000 CAFOs have concentrated American meat production but have also concentrated American manure production, and now create the overwhelming majority of animal manure in the U.S. This proliferation across the country has been almost entirely unnoticed and unchallenged. They are now polluting our rivers and bays with antibiotic-, hormone- and nitrate-laden runoff, and ruining summer barbeques and property values for anyone who is unfortunate enough to live anyplace near one. Of course, we don’t want to discourage Earth Day activities just because they are non-controversial. It is necessary to find ways people can do things appropriate to their level of awareness and commitment. It is a good thing to advocate for more bicycles and recycling options, to replant trees to replace ones we cut down, encourage solar power, and to teach kids how to build worm farms. But, alas, saving the environment cannot occur with non-confrontational projects alone, any more than a drug-infested community can be cleaned up with posters and police visits to schools. A community with drug and crime problems cannot restore a crime-free environment merely with “partnerships” with drug dealers. It must confront its criminal element. Indeed, it would be a foolish community that financed its crime-prevention program with “sponsorships” from drug dealers. If it did, it would get toothless programs to fight crime problems just like the toothless diversions corporations promote to “fight” environmental problems. A community that adopts solutions to either crime or environmental problems that treats criminals or polluters as “partners” and gives them plaques for their “small, but positive steps” is not stopping crime or pollution. It is just becoming, at best, an enabler and, at worst, an accomplice. If we are to create community-based environmental awareness, we need to encourage practical projects. Activities and projects that can be packaged in a kit can be sent to schools and local groups looking for alternatives to the thin gruel that presently serves as teachers’ aids. Here are practical, hands-on projects suitable for community groups and students that will educate people about the most important environmental problems facing their communities. They are hands-on opportunities that are easy to organize, fun to do, and will provide substance for people who want to do something for Earth Day. They will help restore the balance between well-funded, well-connected, and politically powerful corporations and the average person. 1. Who controls the land in your county? All community environmental activism starts by finding out exactly who controls the land, how they got it, and what they intend to do with it. Tax and property records are open and available to everybody. To understand the true sources of “power” in an area, prepare a report identifying the top ten landowners in the county, how much property they own, and where their land is located. When the Coast Range Association researched all the counties in Western Oregon for industrial forest ownership, they learned that four or five corporations owned 70 to 80 percent of the land in those counties, most of those corporations were out of state, and the largest landowner was a non-U.S. corporation! From this type of research, people will learn that a corporation powerful enough to flout environmental laws is also strong enough to get its taxes assessed at reduced rates and obtain public funds to run its business. When you get around to advocating environmental enforcement, these kinds of facts will make it easier to get your message understood and acted upon. 2. Who owns your local newspaper? Most of what you know about your community depends on what your local newspaper is willing to tell you. Who really owns the news in your community? Count up the column inches in the advertisements to see what individuals and businesses actually pay the salaries of the editors and reporters. If your community’s biggest problem is sprawl and over-development, it is useful to know what percentage of the local paper’s revenue comes from real estate ads. 3. Make a checklist of environmental-related contacts. Make a list of all city, county, state, and federal officials and agency staff who have responsibility for the environment: state environmental quality offices, Army Corps of Engineers; city, county and state planning and land-use departments; and state and federal Fish and Wildlife agencies. Include a one- or two-sentence description of the responsibilities of each, along with a contact name, title, address, fax, phone, and email. Call it the Citizens’ Action List. Then when citizens want to inquire about a potential problem, they will have a way to do it. No matter what issues arise, there will be a guide in-hand that shows people exactly where to inquire, who is responsible, and who to contact. 4. Who finances Earth Day in your area? It will be hard to do anything substantive to improve things for Earth Day if the planning committee and organizers are the same people who have created pollution, sprawl and over-development in the first place. They will be paid to participate and you will probably be just a volunteer. And they will have more time and resources than you do. Keep them off the planning and organizing committees in the first place. If corporate “bad guys” want to get together to help with recycling or promoting bicycles, that is fine. Just don’t get real activism mixed up with their treacly feel-good “everywhere and nowhere” schemes. At a minimum, make sure your Earth Day committee doesn’t include any corporate criminals. 1. Who finances the political campaigns of your elected politicians? If you are involved in any environmental campaign where the solutions you seek involve elected politicians (or anyone accountable to an elected politician), you need to know who pays for their campaigns. Fortunately, in the United States, contributions to politicians must be reported. Every contributor’s name, occupation, contribution date, and amount is on public record for anyone to examine. For example, if your county’s biggest problem is corporate pig farms and the hog industry is providing the lion’s share of funds to finance state political races, you are unlikely to get anyone on the state level to take you seriously. Political contributions provide perfect pointers to the issues and positions that politicians will favor and the people to whom your elected officials will respond. Many contributors will be names that are unknown to you, but by looking for their addresses and common surnames, you can find spouses and children of corporate employees who use this to get around the campaign limits. If any names of large contributors are unknown to you, track them down to see what special interest they represent. In general, especially for politicians and officials friendly to “bad guys,” nobody donates $500 or more without some financial interest. When a corporation wants to invest in a candidate, you may find half or more of their contributions coming from their company attorneys, lobbyists, members of their board of directors, and their families. 2. Has your representative sponsored any anti-environmental bills? The best-kept secret in America is the continual stream of anti-environmental bills that legislators generate. Many more bills pass in committees and sub-committees than ever become actual laws or make the news. The voting record of legislators is usually far worse than is generally understood. The continual passing of laws restricting land-use control and enforcement of endangered species acts, the defunding of environmental enforcement, and the advancing of pro-development and sprawl-type schemes, hobble regulatory agencies and keep them continually on the defensive. Most citizens are completely clueless about what their legislators are doing. Your local newspaper is not likely to tell you. Monitor the legislative committees and find out about environmental issues and about “bad votes.” Write them up as letters to the editor or op-ed articles for the local newspapers in hopes you can inform your community about legislative issues that adversely impact your area. 3. What bad bills are moving through your state’s legislature? Get a list of bad bills and special interest legislation from the League of Conservation Voters, the League of Women Voters, the Sierra Club, Audubon, the Wilderness Society and other national groups with a presence in your state. Most likely they will know what will be coming up for a vote. Find out how a bill works its way through the legislature and where bad bills are in the process. Learn how your representative intends to vote on pending bills and publicize this information. 1. Where are the toxic dumps and Superfund sites in your area? Recently, information has become available about the location of every toxic dump and polluter anywhere in the country. If you are concerned about air and water pollution in your area, find out who is responsible for creating it. Make multi-colored maps showing the prevailing wind and surface- and ground-water flows in your area relative to the known polluters and toxic hot spots. This information will be useful in dealing with proposals for plant expansions, new housing developments, and all “growth” and community health related issues. To find the names of your community’s polluters just go to http://www.scorecard.org/ and enter your zip code. 2. What development and sprawl is in the pipeline? County planning department records are open to the public and there is no reason for anyone to be surprised to find bulldozers going in and destroying a forest or filling a wetland. All development plans in the U.S. are filed and processed months—sometimes years—in advance and there are usually many ways citizens can modify or stop these schemes. But you must know at an early stage exactly what projects are being proposed if you hope to influence them. Make lists that track the status of proposed projects, where they will be sited, and when hearings will be held. Look back at the meeting minutes to see what members of your planning commission always vote to approve bad projects and who votes against them. Find out those members’ backgrounds and who appointed them and when the next vacancy will occur. If there are limitations on how many developers can serve at one time, see if these rules are being observed. Are developers and contractors getting appointed to planning boards without disclosing who they really represent? Do developers recuse themselves from decisions where they have a conflict of interest? 3. Are there threatened and endangered species in your area? The first responsibility of all people, and especially environmentalists, is to protect and retain the full complement of all species in viable ecosystems. To do this, you need to know what plant and animals are in danger and where they are. State and federal agencies maintain listings and surveys for Threatened and Endangered Species. Know where they are located so you can track, and hopefully stop, any projects that might adversely affect them. Talk to your local and state fish and wildlife biologists. They always know where adverse activities to threatened and endangered species are being planned. Get on the Army Corps of Engineers’ list to be notified of any wetlands fill and removal permits. Set up tours to visit these places. Every area is guaranteed to have one or more world class environmental problem well off the public radar. For example, real estate agents and home builders in Houston prevented FEMA from issuing updated floodplain maps so home building in areas guaranteed to flood could continue. Pennsylvania turned its university system into a publicly funded PR firm to promote fracking. For mere pocket change, billionaire hobby farmers get the federal government to grant perpetual leases on millions of acres of public land to create private empires that stretch from horizon to horizon. New York pays billions of green energy dollars to subsidize foreign companies to build industrial wind turbines that kill birds and ruin communities or subsidize industrial biomass projects that require whole forests to be logged and turned into pellets. States pass freedom-to-farm bills (to allegedly protect Old MacDonald’s Farm) that allow the creation of industrial meat factories (CAFOs) that cause horrific pollution and air quality problems. Where do you start looking for your elephant in the room? Without exception, every bad project gets a focus group tested name that is soothing and friendly. So, do a google search with your community’s name, then add these words: green energy, sustainable economic development, renewable energy, resilient (thriving) local communities, family wage jobs, and partnerships. If you are cursed with factory farms, make a map of all of them in your area and find out when they were permitted and how many animals they imprison. Find out where they spread their manure and check water quality downstream from them. See if the state has any permits to expand any of them. Has it had any environmental violations for spills? Where does it store its manure? Check with property records to see if adjoining property values have been lowered. Survey adjoining homeowners to see what problems it has caused. 6. Boycott businesses that finance anti-climate change advocacy. Are there any major companies who promulgate anti-climate change propaganda in your area? Expose them and start a boycott against them. 7. Have a community trash pickup day. Every community needs at least one day each year where the whole community picks up all its trash. Divide up the community into sectors—each with a captain—and create teams. Get someone to donate the trash bags and pickup fees. These always create a lot of good morale and give people a better feeling for their communities. Also, cleaned up areas are less likely to attract trash in the future. 1. Examine your state’s energy programs. Who are the main beneficiaries of your state’s programs to create or save energy? Are funds available to help average citizens weatherize homes and reduce energy bills? Do existing programs encourage small local energy businesses to help homeowners save money on their heating bills? Are homeowners incentivized to replace energy inefficient appliances? Most energy saving/creating subsidies are distributed to large foreign corporations for solar and wind projects and large engineering companies for biomass boondoggles. Find out the types and sources of the local fuel types your community uses. Find out where it comes from and make maps showing how it gets to you. 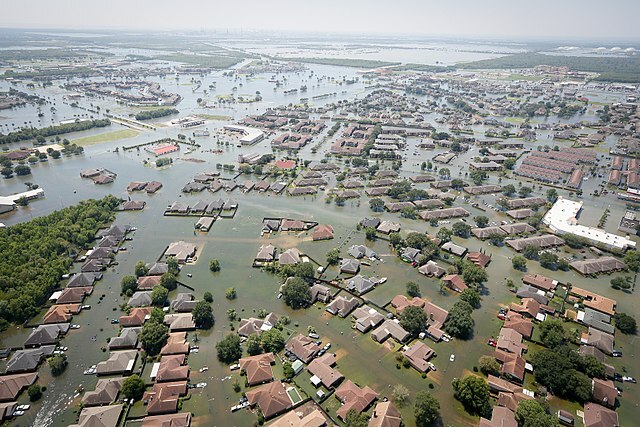 As this is written hundreds of thousands of people in Houston are coping with homes which are flooded with a toxic stew of sewage, pesticides and chemicals. If even a tiny amount of the energy that went into Houston’s Earth Days had been spent organizing and educating the community on the very real environmental dangers created by Houston’s wildly obsolete and erroneous flood plain maps, and the systematic gutting of building codes that allowed home building in areas certain to flood, possibly tens of thousands of homes would not have been flooded and their owners would have been spared the horrific trauma they are now suffering. The first Earth day almost 50 years ago organized 40 million people and led to strong clean air, clean water and environmental legislation with real teeth. Nothing would improve the environmental condition of the country more than re-establishing Earth Day as the one day each year people get together to take real action against individual polluters and the specific problems in their own communities. In 1970, our country created the amazing tool of Earth Day to show how citizens can work together to solve environmental problems in their own our communities. Let’s use it.